Symbol-laden works by Diné (Navajo) artists and others deal head-on with a sensitive issue and its deleterious effects. Subtitled “The Impact of Uranium Mining on Navajo Lands and People,” the show offers works communicating the anger, frustration and sorrow connected to widespread illness on the reservation due to uranium’s toxicity. At the same time, the show celebrates Diné culture and love for the land, tinged with the hope that beauty will be restored. “Hope + Trauma’s” most prominent installation is at once magnificent and ghastly. 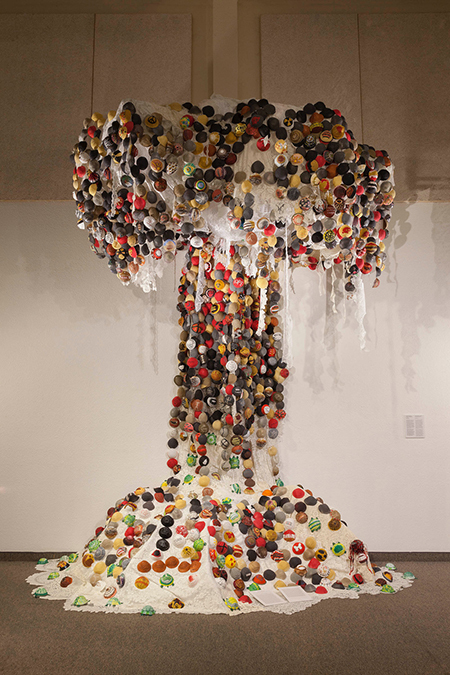 Towering up in the form of a mushroom cloud, “Yellow Dirt Testimony — A Promise in Many Parts,” by Edie Dillon of Prescott, Arizona, rises 10 feet and is composed almost entirely of cascading lace and colored dust masks. Many of the masks are inscribed with a mix of bitter and hopeful messages, often questioning the mid-20th-century pro-nuclear-power mindset that view uranium as the source of endless cheap energy. Muralist Chip Thomas, who also goes by Jetsonorama, has created a kind of translucent memory wall, lit from behind by fiber-optics. Titled “Atomic (r)Age,” it presents news clippings and photos tracing the unsafe working conditions experienced by Navajo miners, who risked developing cancer. Another standout work is a Navajo-style weaving titled “When They Came Home,” by Flagstaff artists Ann Collier, Kim Hahn, Jane Lilly Benale and Malcolm Benally. The rug’s multicolored stripes symbolize water, earth and farming, except for dominant yellow stripes representing the uranium dust that permeates Diné homes. Its understated presence, alongside the larger photo installations, paintings and other pieces, proves both cathartic for the families involved and eye-opening for those new to this enduring issue.